Is BMW Testing a B Class Killer? 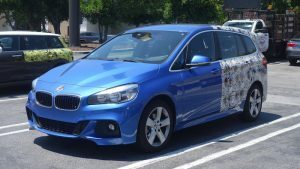 Thousand Oaks, CA – A barely camouflaged BMW that looks a lot like a Mercedes B class was being tested along with what appears to be the new Mini Countryman. That isn’t really a surprise given that Mini is owned by BMW or is it? So why would BMW build a B Class competitor? Who knows. Audi has done a bang up job with the luxury micro car market. I’d drive anything from the A-3 on up, but the B Class? Nope. Todays lineup of BMW’s is already a pretty wide swath, with a 1 series, 2 series, 3 series, 4 series, 5 series, 6 series and 7 series. What is this thing going to be called, the box series? Even in camo you can tell this isn’t anything nearly as cool as the new mini sitting next to it. Yes Mercedes sells work trucks too, but this doesn’t look likes it’s equipped to be a run-around cake hauler does it?